So, we set up a DBA Scenario for Poitiers at Triples. A big part of the plan is obviously to encourage people to think about the SoA Battleday at Bletchley on the 26th April. We used Richard Lockwood's Battle Pack (download from the website) and extensive reading to resolve some of the problems ... the great disparity between the armies, the characteristics of the battlefield, the advantages that allowed the English to achieve so decisive a victory. Was this a longbow victory, and what was the herse formation? 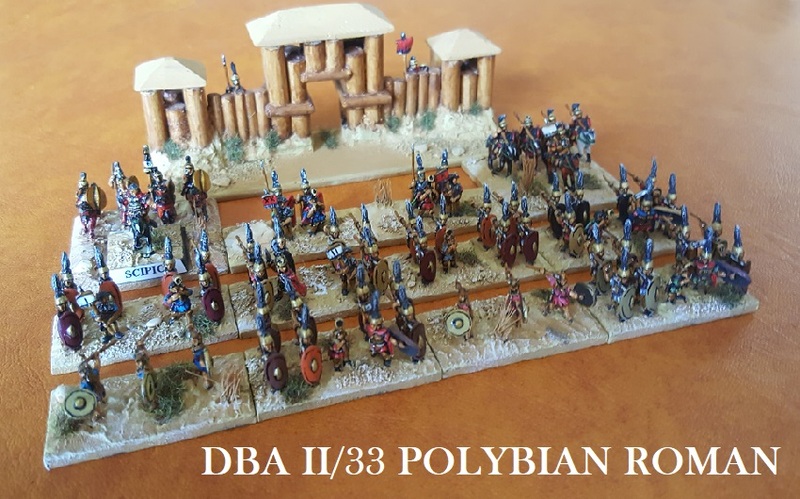 How much of the battle should we depict for a DBA game? How should we model the hedge that defined the English battle line? 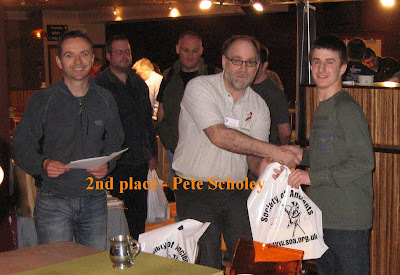 Here are some photos and details of the winners from this year's DBA Northern Cup. The caption neglects to mention that the SoA team was made up of Paul, Tony and myself, taking turns to play, and that the honourable general so soundly walloped in the final round was .. well .. I could hardly be expected to let us win a prize ourselves, could I? Nevertheless, my intentions would have been irrelevant ... I was out-thought, outplayed and only the dice could have saved me. 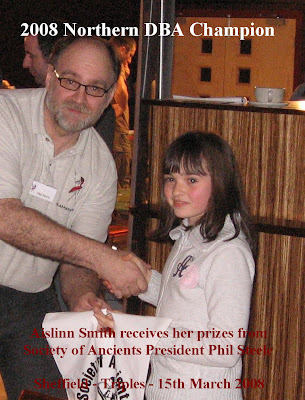 Aislinn very kindly acknowledged how poor my dice rolls had been. But, no - it wasn't down to that: a worthy champion had rounded off an impressive series of games. Thanks to everyone who participated: a friendly group of players, and an excellent job done by Paul and Tony ... Look out for this next year... Between games, there's an excellent show to visit, too. We did another run though of our 2007 showgame Arsuf at Vapnartak.